^ A.A. (2012年9月28日). “Rogue downloader faces additional felony charges”. Chronicle of Higher Education (D.C.): p. A18. "According to the original indictment, Swartz was working as a research fellow at Harvard University’s Edmond J. Safra Center for Ethics …." ^ a b Susana Hak et al. (2011年1月). “Compilation of Dec. 15, 2010–Jan. 20, 2011” (PDF). Hak–De Paz Police Log Compilations (MIT & Cambridge, Mass.). http://mitcrimeclub.org/11pologDec15Jan20.pdf. "Jan. 6 … Aaron Swartz, was arrested at 24 Lee Street as a suspect for breaking and entering at E15 …." ^ Johnson, Bobbie, Recap: cracking open US courtrooms, The Guardian, 11 November 2009. Retrieved 31 January 2013. ^ Granick, Jennifer, Towards Learning from Losing Aaron Swartz: Part 2, The Center for Internet and Society at Stanford Law School blog, 15 January 2013. Retrieved 26 January 2013. ^ a b Commonwealth v. Swartz , 11-52CR73 & 11-52CR75, MIT Police Incident Report 11-351 (Mass. Dist. Ct. nolle prosequi Dec. 16, 2011) (“Captain [A.P.] and Special Agent Pickett were able to apprehend the suspect at 24 Lee Street.… He was arrested for two counts of Breaking and Entering in the daytime with the intent to commit a felony ….”). ^ a b Cohen, Noam (2013年1月20日). “How M.I.T. ensnared a hacker, bucking a freewheeling culture”. The New York Times: p. A1. http://www.nytimes.com/2013/01/21/technology/how-mit-ensnared-a-hacker-bucking-a-freewheeling-culture.html. "‘Suspect is seen on camera entering network closet’ [in an unlocked building].… Within a mile of MIT … he was stopped by an MIT police captain and [U.S. Secret Service agent] Pickett." ^ Peters, Justin (2013年2月7日). “The Idealist: Aaron Swartz wanted to save the world. Why couldn’t he save himself?”. Slate (N.Y.C. ): 6. http://www.slate.com/articles/technology/technology/2013/02/aaron_swartz_he_wanted_to_save_the_world_why_couldn_t_he_save_himself.6.html. "The superseding indictment … claimed that Swartz had ‘contrived to break into a restricted-access wiring closet at MIT.’ But the closet door had been unlocked—and remained unlocked even after the university and authorities were aware that someone had been in there trying to access the school’s network." ^ Lipinski, Pearle and Joseph Maurer, Police Log (12/19-2/5), The Tech, 18 February 2011 (Volume 131, Issue 6). Retrieved 24 January 2011. ^ Singel, Ryan (2011年2月27日). “Rogue academic downloader busted by MIT webcam stakeout, arrest report says”. Wired (N.Y.C.). http://www.wired.com/threatlevel/2011/07/mit-webcam-swartz/. "Swartz is accused … of stealing the articles by attaching a laptop directly to a network switch in … a 'restricted' room, though neither the police report nor the indictment [mentions] a door lock or signage indicating the room is off-limits." ^ a b c McCullagh, Declan, Swartz didn't face prison until feds took over case, report says, CNET, 25 January 2013. Retrieved 7 February 2013. ^ Sims, Nancy (October 2011). “Library licensing and criminal law: The Aaron Swartz case”. College & Research Libraries News (Association of College and Research Libraries) 72 (9): 534–37. ISSN 0099-0086. http://crln.acrl.org/content/72/9/534.full 2013年1月13日閲覧。. ^ United States v. Swartz , 1:11-cr-10260, 106 (D. Mass. filed Jan. 14, 2013). ^ a b Kemp, Joe; Trapasso, Clare; Mcshane, Lawrence ‘Larry’ (2013年1月12日). “Aaron Swartz, co-founder of Reddit and online activist, hangs himself in Brooklyn apartment, authorities say”. The New York Daily News. http://www.nydailynews.com/new-york/co-founder-reddit-hangs-brooklyn-apartment-article-1.1238852 2013年1月12日閲覧. 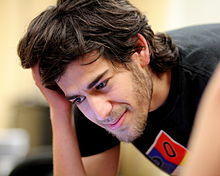 "The 26-year-old Swartz was facing trial next month in a controversial computer-hacking case. He left no note before his apparent Friday morning suicide inside the seventh-floor apartment on Sullivan St., police sources said"
^ Hsieh, Steven, Why Did the Justice System Target Aaron Swartz?, Rolling Stone, 23 January 2013. Retrieved 26 January 2013. 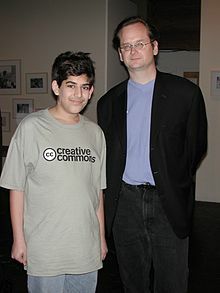 ^ a b c Gross, Grant, Lawmakers pledge to change hacking law during Swartz memorial, InfoWorld, 5 February 2013. Retrieved 5 February 2013. ^ Murphey, Shelly, US attorney’s husband stirs Twitter storm on Swartz case, The Boston Globe, January 16, 2013.. Retrieved January 17, 2013.